In this IT4IT interactive guide we provide a condensed and easily accessible reference, outlining the Value Drivers, Key Activities and Proof Points of Strategy to Portfolio. 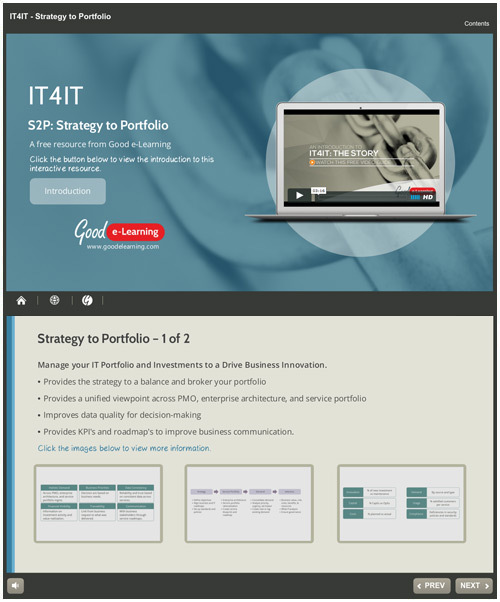 Strategy to Portfolio is the first of the four IT4IT Value Streams. It provides IT organizations with the optimal framework for interconnecting the different functions in involved in managing the portfolio of services delivered to the enterprise to fulfill the organizations strategy. Activities such as capturing demand for IT services, prioritizing and forecasting investments, Enterprise Architecture, Service Portfolio Management, and Project Management require data consistency and transparency in order to maintain alignment between the business strategy and the IT portfolio.